Libby Schoettle was interviewed by Simona Gouchan for Paris-based L'Express magazine in May 2015. Read the full interview: Who is Phoebe? in French or read on for English translation. 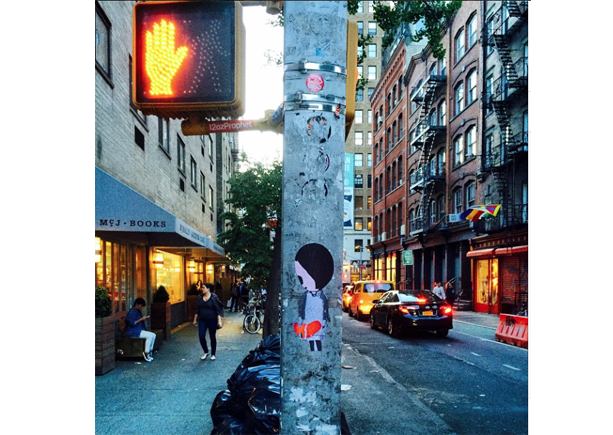 For the last few months, the little character of Phoebe, Instagram rising star, is appearing on the walls of Soho and of the West Village. Meet her creator, the New York artist Elizabeth Schoettle, Libby to her friends. It is my alter ego. A character with a huge head and a tiny mouth who spends her time wondering what place does she occupy in the world. Phoebe succeeds to express a lot of things in a few words words, the opposite of me who always try to please everybody. As I have difficulty expressing what I think, I come home to write it down and express myself through her. Phoebe is my release. How was this character born? In Paris, 14 years ago, I am very afraid of flying and it was my first trip outside the United States. I departed on September 10, 2001 to join my boyfriend. The following day, the (NY) towers collapsed and the entire world was in shock. 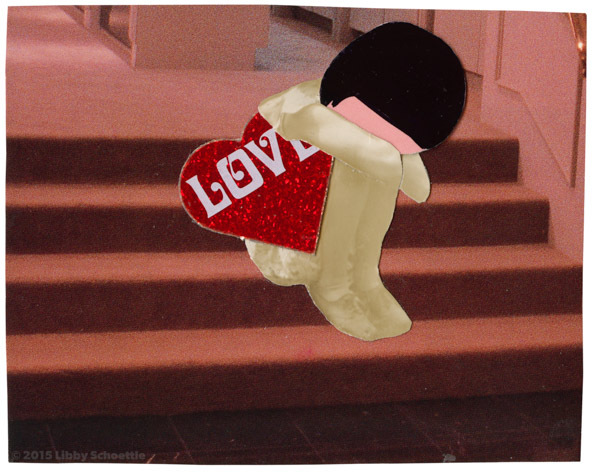 My boyfriend had to go to London and as there were no flights, I remained alone for three weeks. I spent my time taking photos. One day at the Flea Market (LesPuces in Paris) I found an old-rose sweater and a redpair of pants. colors that reminded my of my childhood I created a silhouette, started by using this vintage outfit and I added a bowl in place of the head. This was the first incarnation of Phoebe. For three years, her character had no face. I would use objects: an old type writer, a lamp, etc.. instead of her head. I would lay the clothes on the floor, them I would take a photo for its immortality. I often use old photos bought on Ebay. I spend a lot of time in antique shops and flea markets. I pick up objects from the ground. Everything helps me to create Phoebe. I often go to the Strand bookstore, and to records shops. Every time I make new discoveries. The face of Phoebe is made from records’ covers. Once I draw her eyes and lips, she comes alive. From The Catcher in the Rye by J. D. Salinger. This is the adorable sister of the hero Holden Caulfield. I always wondered what could have happened to her. I wanted to use her name, and imagine her life. Your (young) Instagram account is an immediate success? months I've had her lead an existence off the internet, I have her live in the streets of New York, as a heroine of street art. At 20, I had chosen to study cinema, I then wanted to become an actor before realizing that it only would be through art that I could express myself. These last years I have been lucky to have a solo show and I also have been the subject of a book of photos. Right now the producer Jyll Johnstone is making a documentary on my work (see Canobiefilms.org) The infatuation for Phoebe is a comfort to me for my choices. Finally at41 yrs old I have the impression to be understood, heard, accepted and esteemed, of doing something important. Many of your pictures allude to unhappy love stories, self-esteem problems, addiction, but there is also a lot of autoderision (self mockery)? It is true. I have always loved men that I should not. A lot of women can identify with that. When someone stands me up or does not return my call, I try to transfer my disappointment into a picture. I pull out my shears and start to scissor. There are some days when I sit in front of my desk and no idea comes up. I force myself to stay in place and refuse to become disheartened . One must learn to trust oneself, ideas will come. One needs to take time and continue to search. Sometimes I happen to redo Phoebe ten times before being happy with the result. What is the best compliment you ever got for Phoebe? Some followers have sent me their own version of the character where they had included it in their own creations. Often it comes from men. I thought that Phoebe would essentially have a feminine public, yet there are a lot of skateboarders, tatooed ones, graffiti artists and street artists who are fans. I even have received invitations for dates by the grace of Phoebe. I am someone very disciplined. I wake up eat my oatmeal, while checking my Ebay. After that I sit at my desk and I work 4 to 6 hours in a row. Then it is time to go to the gym where I spend 2 hours every day. One hour on the elliptical machine, one hour of pilates. Then I go back home, and look at what I have done during that morning. I try to improve on it. Three evenings a week, I work as a waitress in a restaurant. Before I was going out a lot but lately I have more a tendency to stay at home. 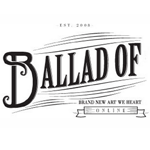 This article appeared in Ballad Of, a London-based publication featuring emerging artists. In Today's Brand New Art We Heart, Elizabeth Schoettle takes us on a trip into the wonderful world of Phoebe New York. Elizabeth, who often goes by the name of Libby, is a New York City-based artist who uses found objects to create evocative scenes and scenarios for her alter-ego character, Phoebe. Using objects such as old book covers, picture frames, Polaroids, and other elements that convey either nostalgia or up-to-the-minute modernity (and sometimes both), Libby speaks through Phoebe to express her feelings about love, loneliness, courage, vanity, joy, rejection, and basically anything else a person can feel. Writer Icarus Blake says, "Elizabeth Schoettle is an artist and a creator of magical worlds. Her alter-ego character, Phoebe New York delves deep into the life of modern women. Ironic, irate, loving and smart, Phoebe always makes us think about the content beyond the aesthetics. These collages are a powerful rendition of the conflicts of our society." Read the full article, "The Magical World of Phoebe New York."